At The Foam Shop we can supply a large and useful variety of Foam Products cut to the size and shape you require for your DIY upholstery project or repair. We stock many different grades of Foam all of which can be cut to your dimensions if you supply us with a template, a sample, drawing or sketch. We can supply you with custom cut foam within the UK for most applications for example sound proofing, sofa cushions, packaging, protection, soft toys, yachts and boats, cars and vehicles and many other things. All our Foam is manufactured in the UK and complies to British Standards. Foam can be cut precisely and accurately in complicated shapes to fit your product and we can provide foam in any quantity from one off parts to large quantities for production and manufacturing. 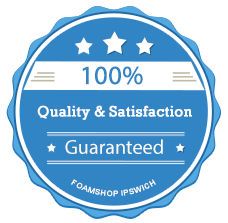 We can deliver your foam to you quickly within the UK for a reasonable postage cost and all our foam is competitive and affordable and is of the utmost quality. Obtaining the correct size piece of foam for your project, what ever that may be, is easy. We are not averse to taking on a challenge; here are a few examples of requests from other customers we have been able to help. Costumes and Props for local theatres.